Food & Fitness: Health for the childbearing year. Online & live classes. There is probably no other time in life where your food and fitness are more important than the year you grow and birth a baby. With our thousands of students over the years, we have seen the difference nutrition and exercise make during the childbearing year, especially with feelings of wellbeing. 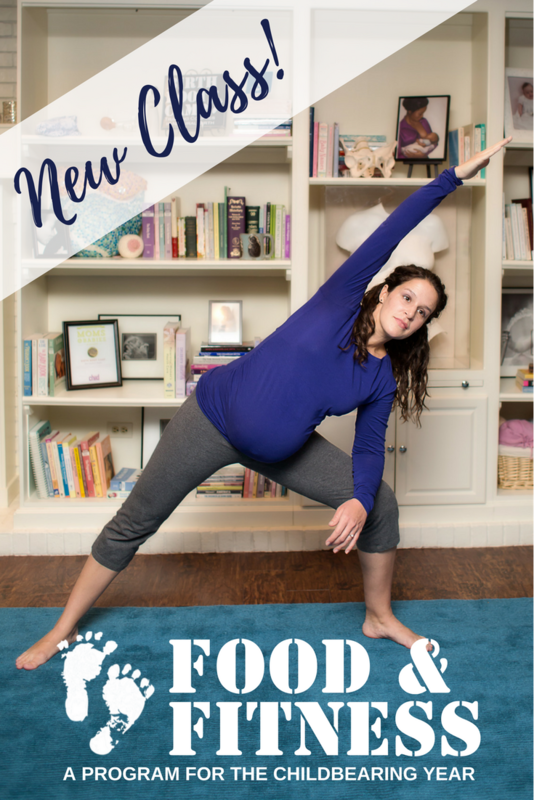 Our Food & Fitness class for the childbearing year has exercises designed just for you that help prepare the body for birth. The nutritional information is incredible too. You get so much with this class, it’s like have a personal trainer for your pregnancy, birth, and beyond. A huge value and a worthwhile investment. If you are feeling yucky and helpless during your pregnancy, it’s empowering to know what you can do! If you love to exercise but need to know what and how to do it while pregnant, you will adore this program. Pregnancy can be an incredible time in your life. Food and fitness can make a difference. Getting in tune with your body before you have your baby helps you find your own inner power and prepare for an amazing pregnancy and beyond. Check out a preview of this incredible workbook that goes along with this class. It’s beautiful. The online baby class option gives you and your partner the flexibility of watching on your own schedule and the ability to pause and discuss as questions arise and practice the exercises as well. It’s perfect for the modern, busy couple. You can find the online Food & Fitness: Health for the Childbearing Year online here. Our childbirth educators are incredible and you can find them all over the country. They can share their experiences, as well as the curriculum, and they are loving, amazing women. You’ll love learning directly from them and gain the camaraderie of others in your class. You can find one of our instructors here. Caring for your mind and body during pregnancy isn’t just something that can benefit your baby: it’s something that pays dividends for you. Your health matters but finding good information can be tricky. The Birth Boot Camp Food & Fitness class gives you an opportunity to practice valuable self-care. You can have an amazing pregnancy and birth!